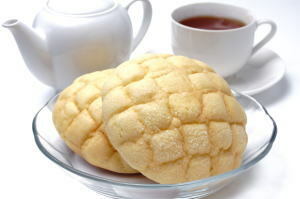 Meron Pan ('メロンパン', is classified into bread), is known as Melon Bun in English, and 甜瓜面包 (Tiánguā miànbāo) in Chinese. It is the Japanese style bread. Butter, Wheat Flour, Salt, Water, Sugar, Dry Yeast. Egg, Milk, Maple Syrup, Shortening.